Spelling of Treasurer: Treasurer is spelled t-r-e-a-s-u-r-e-r. Definition of Treasurer: A treasurer is a person entrusted to the management of funds, whether for the government or for a non-governmental organization, club, or group. A treasurer is also the guardian of a collection of treasures, like a curator. 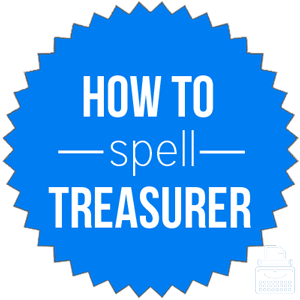 Pronunciation of Treasurer: Treasurer is pronounced trezh-er-er. Treasure rhymes with the word measure, and treasurer carries an extra –er suffix. What does treasurer mean? Treasurer is a noun. A treasurer is the name of the position involving managing the money of a business, organization, government, or group. The treasurer receives, cares for, and disburses the funds of the particular group. It is considered an executive position. Due to her financial background, she was asked to be the treasurer of the college group. As treasurer, all of the club’s financial matters were handled by him. Treasurer may also refer to the keeper of a collection of treasures. The treasurer proudly began to list every item in his collection. As treasurer, she was obsessed with finding and adding new pieces to the prestigious collection. Related to the word treasurer, is the word treasury. A treasury consists of the funds or revenue of a government, corporation, or organization with which the treasurer is charged with managing. Treasury may also refer to the actual place or building in which treasure, or money, is stored. In that meeting, the country pledged not to spend more than it had in its treasury. The officer proposed spending more of the nation’s treasury on space exploration. According to Merriam-Webster’s, the word treasurer was first used in the 14th century. Treasurer is from Middle English tresurer, from the Anglo-Norman word tresorer, from Late Latin thesaurarius, of treasure. Originally, the word comes from Latin, thesaurus, meaning treasure. There are no direct synonyms for the word treasurer, as it is the name of an official position, however, there are some words that can be used in some cases. Treasurer is a noun. A treasurer is a person who is in charge of the money for a group, club, organization, or government body. It is rarely used to refer to someone who is the guardian of a collection of treasures.